Paeonia Flame is one of the earliest blooming peonies in our assortment and is becoming increasingly popular. Because of the bright colour and the striking, open flowers they provide a relaxed, summery atmosphere that makes Flame very suitable for a bouquet. 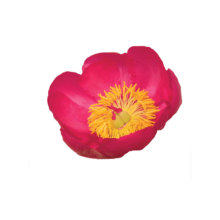 Paeonia Flame is a hybrid peony with single flowers and large petals that are very pink in colour. The centre is filled with yellow stamens. The stems are, like the leaves, thick and sturdy. This peony variety was bred in 1939 by Glasscock, the breeder who is also known for the varieties Mother’s Choice and Red Charm. Tips from the house. First of all, it might be good to know that despite Flame is opening quickly, they last very long. In order to prevent them from opening to early keep them chilled with cold water or in a chiller. Finally, try to use them in a spacious bouquet where the peonies can breathe in. The open flowers of Flame will definitely create a summery atmosphere and will shine as the sun in every bouquet.